Nikki Tate is infamous, even by Las Vegas standards. Her dad is sitting on death row, convicted of killing his best friend in a gambling dispute turned ugly. And for five years, he's maintained his innocence. But Nikki wants no part of that. She's been working on Operation Escape Vegas: playing in illegal card games so she can save up enough money to get out come graduation day. Then her dad's murder conviction is overturned. The new evidence seems to come out of nowhere and Nikki's life becomes a mess when he's released from prison. Because the dad who comes home is not the dad she remembers. And he's desperately obsessed with finding out who framed him--and why. As her dad digs into the seedy underbelly of Vegas, the past threatens everything and Nikki is drawn into his deadly hunt for the truth. But in the city of sin, some sinners will do anything to keep their secrets, and Nikki soon finds herself playing for the biggest gamble ever--her life. 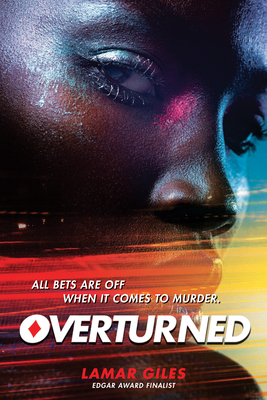 Lamar Giles is the author of Overturned, which was a YALSA Quick Pick for Reluctant Young Adult Readers; Fake ID, which was an Edgar Award finalist and a YALSA Quick Pick for Reluctant Young Adult Readers; and Endangered, which was also an Edgar Award finalist. Lamar is a founding member of We Need Diverse Books. He resides in Virginia with his wife.